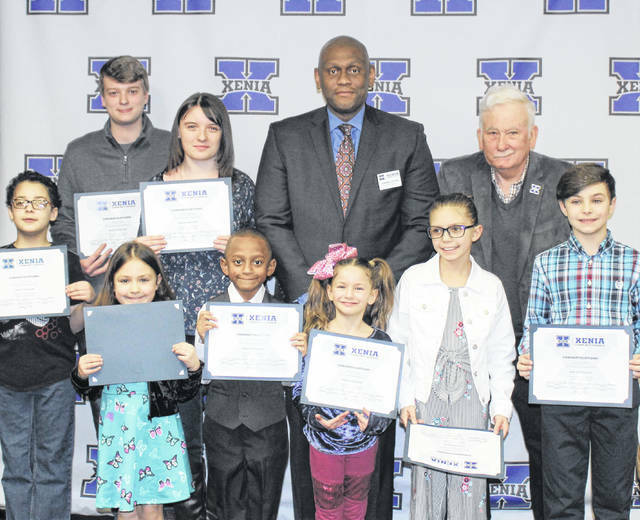 XENIA — The Xenia Community School District Board of Education honored its March Kids of Character at a recent meeting. Recognized were Harper Dolbeer (Xenia Preschool); Cameron Salyers (Arrowood Elementary); Lilly Hallam (Cox Elementary); Stanley Harrison (McKinley Elementary); Eleena Puckett (Shawnee Elementary); Addison Edwards (Tecumseh Elementary); Phoebe Eldridge (Warner Middle School); and Jackson Baker (high school). The following information was provided for each student. Dolbeer is a sweet, funny girl who likes to make people laugh. She follows school and classroom rules and is willing to help others when needed. he takes care of the classroom, keeping materials clean and putting them away when she is done with them. She adapts well to new situations and takes things in stride. She is a joy to have in class. Hallam was nominated by her teacher, Amy Calhoun, who said, “Lilly is a great friend to all. She goes out of her way to include and to be kind to everyone. Lilly is kind-hearted and asks all of the kids in the class to play with her.” She asks students to sit by her on the carpet and at lunch. She always tries to include everyone. Hallam will persist and continue to include others in her play. She is always kind with words and actions. She works hard to learn as much as she can in school and she is a model student for others. Harrison was nominated by his teacher, Kimberly Wright. She said Harrison is an outstanding student — he is always on time for school and three days a week he comes in early to participate in computer lab. He is a hard worker in the classroom. He does his reading homework on a consistent basis and is a good reader. Puckett was selected for being a thoughtful and kind student. She has a big heart and is always kind to others. She cares about each and every person in her class. In class, she is eager to provide a helping hand. Her teachers enjoy having Puckett in their classes because she is a great student who cares about her school work and she is always happy and positive. Edwards is not only a problem solver, but she also has excellent character. On many occasions throughout the year, she has been more than helpful and kind to her peers, from helping others with their Chromebooks to asking for help when the time is needed. Edwards always makes smart choices to better herself and to benefit others. She makes others feel included and has really sparkled in her role as a Student Ambassador. Her teachers can always count on her to be a great friend, classmate, and student. Eldridge is an enthusiastic, caring and hardworking student. She always has a positive attitude and works hard in everything she does. She takes her academics very seriously and never cuts corners when it comes to completing school work. She even takes initiative in her studies to work ahead. Teachers have expressed how involved in the classroom she is by giving her thoughts and reactions to discussions and by asking questions and thinking creatively. Eldridge helps the classroom environment to be focused on educational excellence through modeling a positive attitude and strong work ethic. Baker exudes school spirit. He is not afraid to go ‘all out’ for school spirit days. He is involved in several clubs and organizations, and is an eager volunteer to help others. He is incredibly compassionate. He is frequently seen asking other students how they are doing and giving them a friendly hug when needed. He truly cares about other people. He is a fantastic student, too. He is very bright and always completes his work to the best of his ability.